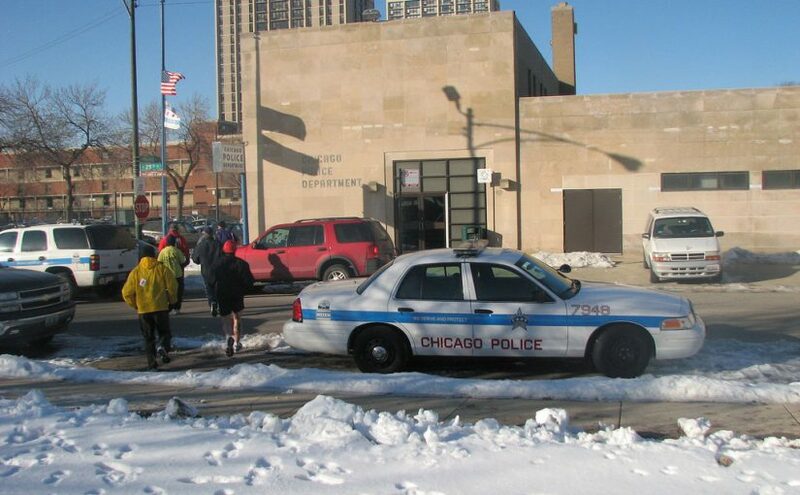 A suspicious white powder that shut down a five-square-block area of Lincoln Park and disrupted traffic across the North Side for about two hours at midday turned out to be nothing more harmless than flour or, more likely, the chalk used to mark jogging paths, authorities said. The substance was placed on the ground, near a west entrance to Lincoln Park Zoo, by a local running club this past weekend, Chicago Fire Commissioner James Joyce said. Earlier, about 11 p.m., police and firefighters declared a hazardous materials alert and closed the zoo and a section of Lincoln Park as they investigated a report of a suspicious substance found near the intersection of Webster Avenue and Stockton Drive. Streets in the area also were closed, as were southbound and northbound exit and entrance ramps of Lake Shore Drive near Lincoln Park. Authorities looked at three piles of the substance and at about 1 p.m. held a news conference to announce their findings. Hashers Go for the Gold. And the Blue Ribbon. And the Guinness And the Sour Apple Martini Shots. The lawyer can’t get his pants off. He pulls down his sweat pants, then his underpants, to the shouting and booing of 80 frenzied runners grasping plastic cups of Guinness in a leaf-spattered back yard in Arlington. They have been drinking and running and drinking, and now — at the ceremonial end of their beloved sport known as hashing — they’re getting quite a show. In the midst of the circle on this Thursday evening, the 57-year-old lawyer for the Department of Transportation sits on the leaves to work the sweat pants over his sneakers. The crowd groans. The man struggles. The crowd drinks. The man triumphs, standing up (groan) and pulling on a pair of honorary shorts stamped with a hashing logo. He seems not at all embarrassed. But when you’ve been hashing for 10 years, when you’ve hashed in Kuala Lumpur, Tasmania, Goa, Zimbabwe, South Africa, Beijing and Madrid, as he has, you pretty much master the art of disinhibition. “What goes at the hash stays at the hash,” says the man, and thank goodness for that. Hashing: worldwide phenomenon, 64 years old. 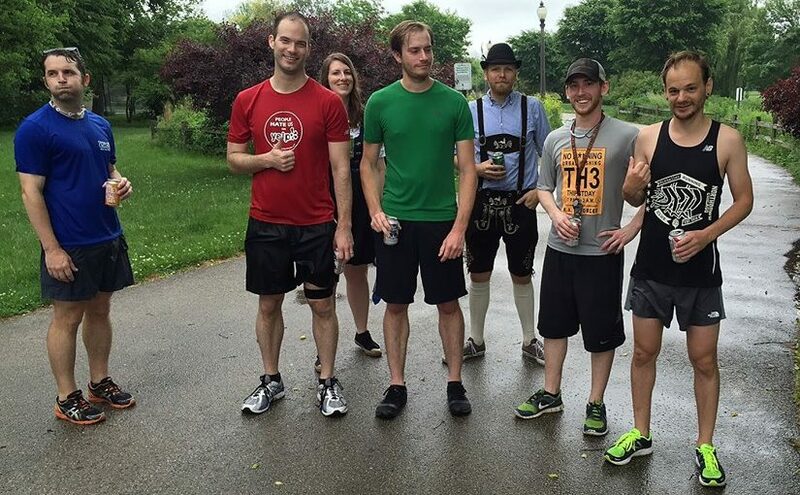 It is a running and drinking sport that feels like a traveling frat party. Hashers run through woods, along bike paths, along city streets and through tunnels, stopping en route for alcohol, ever more alcohol. 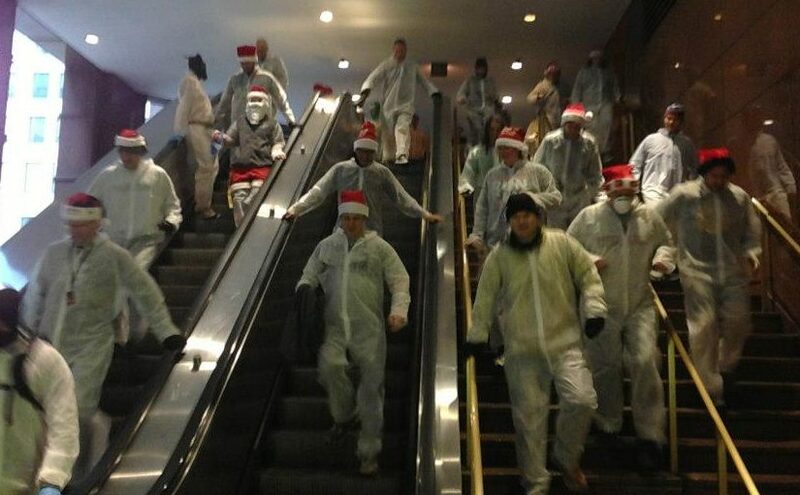 Some call hashing a cult, though it’s way too disorganized for that. Some say it has the same atmosphere as college rugby, with all the beer and none of the rugby. There are at least 10 hashing groups in the D.C. area, and each runs a different route each time and follows slightly different customs. 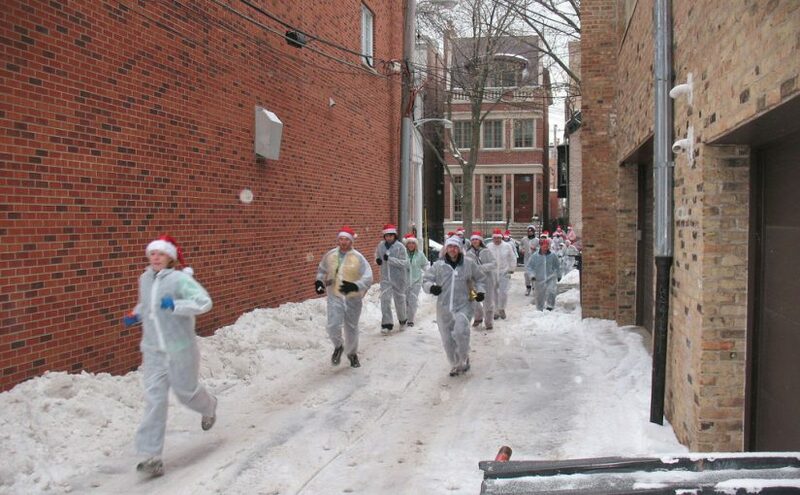 Here’s how one of the larger chapters, the White House Hash House Harriers, did it on a recent Sunday. They drank beer, then they ran through the streets of Ballston, following a trail laid out in flour by folks known as “hares.” They stopped at a park — panting — and had sour apple martini shots. Then they ran some more and had more shots. Then they ran some more and stopped for beer. 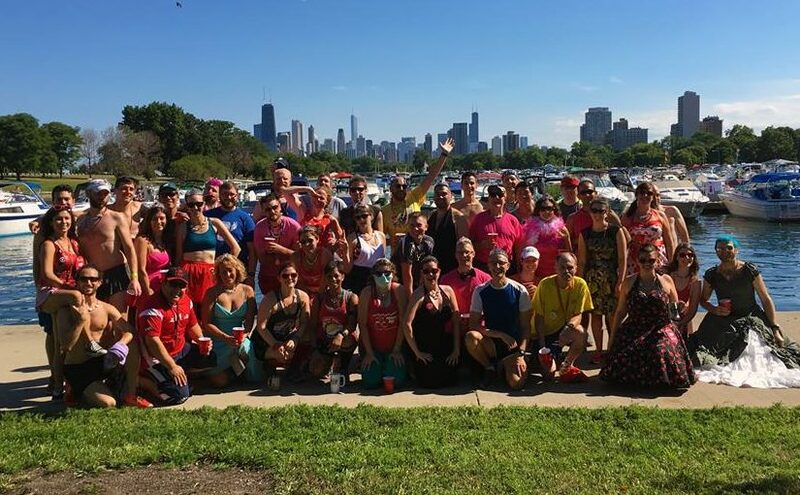 When they’d run a total of four miles to the end of the hash — temporarily set up in an empty parking lot — they had more beer and sang songs and made fun of each other for an hour. Then they went off to a bar. Hashing is based on Hares and Hounds, a British schoolboy game going back at least to the 19th century. The first hash was held by British expatriates living in Kuala Lumpur, Malaysia, in 1938 and then was spread around the world by the expat and military communities, according to Paul “Flying Booger” Woodford, of Tucson, who maintains a hashing Web site, www.half-mind.com. The hash works like this: The hares lay a trail marked with symbols in flour, chalk or paper, which the rest of the pack later follows. False markings make the run more interesting. The point is to keep the pack in a state of collective confusion. “Racing” is considered a dirty word, and anyone who seems to be trying to finish the hash first may be guilty of a violation (more on this later). But hashing is more than an activity; it is a culture. There are about 1,400 hashing groups worldwide, according to hard-core hashers who keep track of such things. Last month, 937 people from around the country descended on Washington for its annual Red Dress Run. 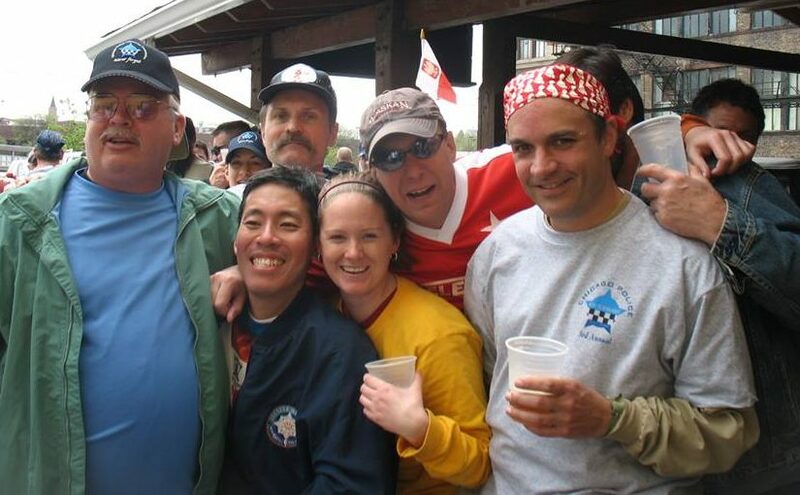 Hashers consider themselves part of an international family. When they travel, they explore new cities via hashing. They stay with hashers they’ve never met before. There are ordained ministers, like Woodford, who perform hash weddings. (In one he performed, the bride and groom were the hares and everyone ran in white gowns.) One married couple in the White House hashers has 1,000 hashes between them. Some hashers live together as roommates, like the four who live in the so-called Pleasure Palace, a house in Arlington. But cut to the chase: How does one drink and run? As a “virgin” hasher, you may get to a beer check partway through a run and find yourself nauseated at the very thought of swallowing suds. (The groups provide water and soda as alternatives.) 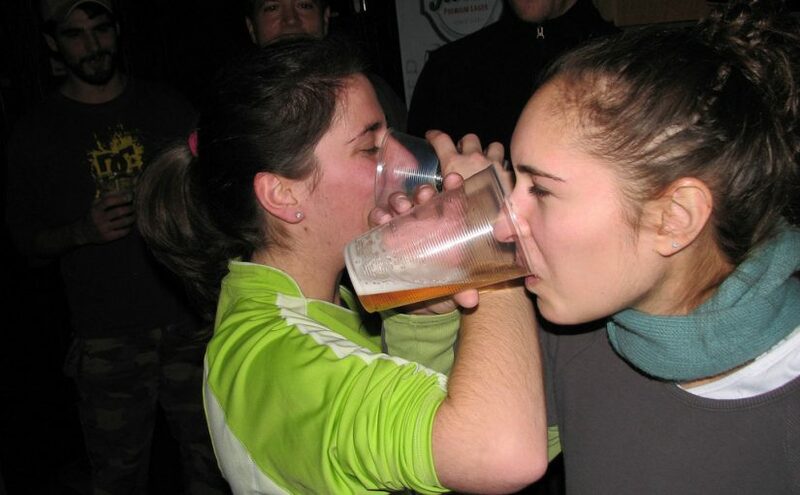 Even some veteran hashers drink only, say, half a beer during their run, and wait till after to drink more. And there are those who hash for the camaraderie and don’t drink at all. But for those who wish to test their drinking-and-running stamina, the trick seems to be practice. During the last Marine Corps Marathon, one hasher, a Marine officer who wants anonymity made use of his extensive hashing training. Before the race, he says, he had five beers, a glass of merlot and a cigarette. 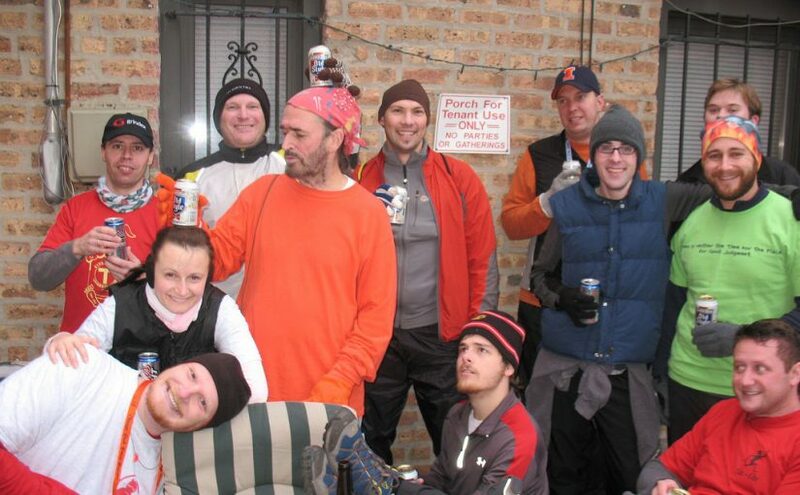 During the run, he had a bloody mary, then — along with other hashers — another beer at the 22nd mile. He finished within 3 hours 10 minutes, good enough to qualify for the Boston Marathon. Hashers are also afforded freedom by the fact that they go by nicknames, which tend to be derogatory and loaded with sexual innuendo. Here are some of the tamer ones: Pimp of Sarajevo, Summer’s Eve, Big Bird Turd, Dumb&Dumber. It’s entirely possible to hash with someone for years and not know the person’s last name. It’s also possible to forget just how foul someone’s nickname is. 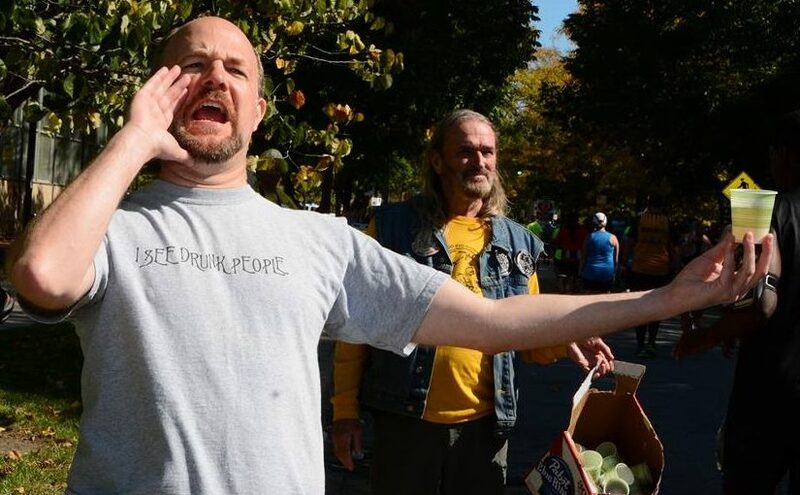 It’s the darnedest thing, says one hasher, when you’re walking down a street in Alexandria, see a hashing buddy and start to call out his expletive-loaded nickname. Alas, the rules of life are stricter than the rules of hashing. Speaking of rules . . . They do care, however, if a participant takes things too seriously. Indeed, you do. Every Day Is Wednesday is considered the youngest hash in D.C., with many members in their twenties, and a good deal of flirting and dating takes place there. Annette Dumont, 27, says this is made easier by the absence of her non-hashing friends. He is very glad that his girlfriend is also a hasher, because she understands him. Recently, she was sorting through their clothes and found a single leg hose. Hares: Mudsucker and Just Do Me Slowly (virgin hare) Venue: Mother Hubbard’s (7 W Hubbard) Time: 3:00 pm Cost: $8 or $6 and your own CTA pass for the “L” The big post-Marathon Hash!!! Out of Town Hashers expected: 7 hashers from Tulsa plan on attending. Possibly Florida and DC too. 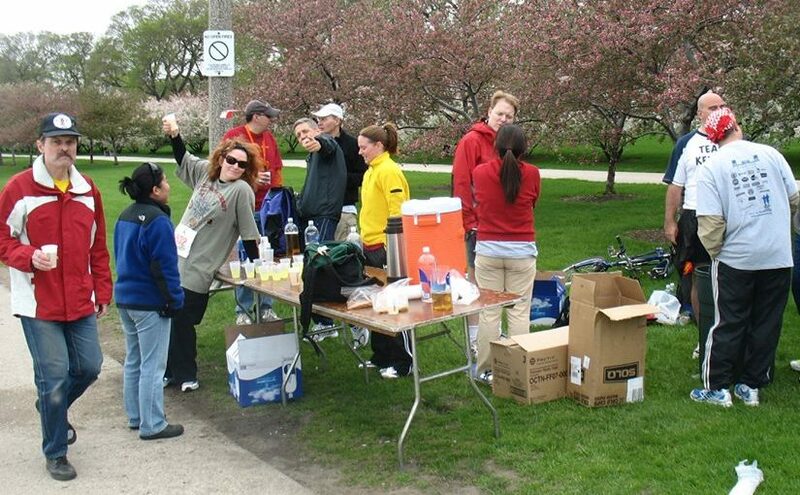 Mile 22 of the Marathon Time: 9:00 and on The annual Mile 22 beer stop for the marathon will be held again. Last year we had about 10 hashers giving out beer, and we went through cases of the golden “carbo load” brew. About 200 stopped for a taste. This year looks even better. Eight hashers from Tulsa and some from south Florida plan on stopping for a brew, then join us for the hash later. The plan: Anyone who wants to meet at my place (3520 S Wallace) prior to the stop (yeah, I could use some help hauling the beer over) is welcome anytime after 9:00 am. We will head over around 9:45. Or you can go directly to the beer stop. The beer stop will be on the east side of the Dan Ryan, south of 35th Street, i.e. one block east of Sox Park. Take the Red Line to 35th (Sox Park), go west to get to my place (Wallace is a stop light). Beer stop – exit the station, go east (left) 50 yards, south to the beer stop, usually about 100-200 yards. We will have a big sign there and will be on the sidewalk by the railroad tracks. We usually keep the stop open until 11:45 or so. The Dan Ryan exits are closed at 31st through 39th. You can exit at the next stop to the south and double back to my place (go west to Wallace then north). Parking near the beer stop is tough, suggest that you try my area. If the area near my house is full, go a few blocks south or west to find street parking. My home will be open after the Beer Stop to anyone while I head out to set the trail for the hash.